If you're the least bit observant about fashion, you can easily see that fringes are a significant fashion features of 2015. You can see how popular they are by noting all the stylish people walking city streets with fringe on their clothing or accessories. Whether it’s the fringe rounds on handbags or hemline fringes, fringes can add class to your wardrobe. If you think fringes are new to the fashion world, think again—They’ve been around for almost a century. The Twenties—The Roaring Twenties were a decade known for long tassels in the fashion world, as evident in the design creations of fashion designers such as Elie Saab and others. Consider the theatrical production of “The Great Gatsby,” where the 20s flapper girls had tassels on their clothing. Also, there was the famous fringed Charleston dress of the Roaring Twenties, which is so-named for the well-known Charleston dance. The Fifties—The rock ‘n roll era of the 1950s displayed fringe on biker jackets, such as the jacket worn by Elvis Presley. The Sixties and Seventies—Fringe made another comeback during the 1960s with hippy-style and gypsy garments. This Bohemian look, for both men and women, continued into the 1970s. For example, remember how fringes on skirts and suede jackets were the fashion rage over 40 years ago? The Eighties—In the 80s, some of the top designers, including Azzedine Alaia, and others, made good use of the tassel in many of their clothing collections. The Nineties—One of main ways fringes were worn during the 1990s were on cutoff T-shirts. Today, the fringe look continues to be more popular than ever, as fringes or trims are commonly found on dresses, skirts, jackets and accessories. 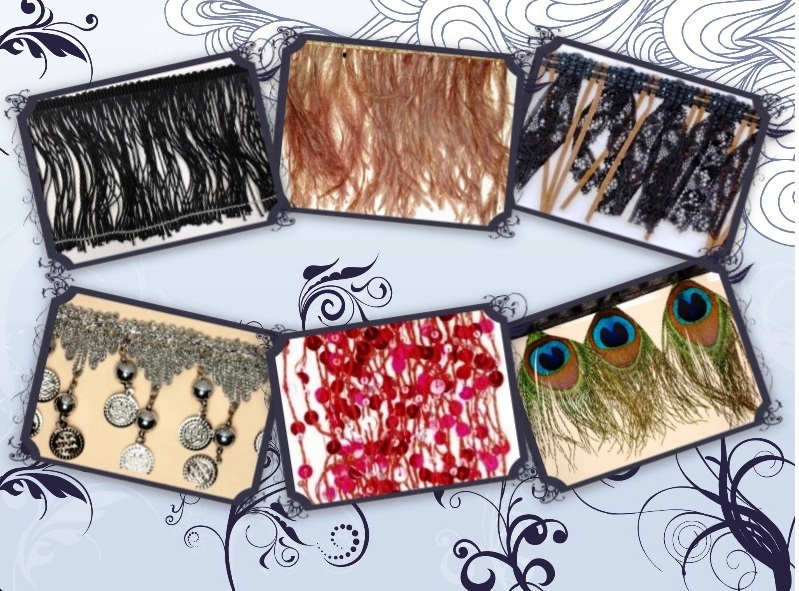 If you’re considering adding fringe to your wardrobe, check out TrimCite.com. It’s one of the many trim products you’ll find at our e-commerce store. We also have a wide range of products used for various trim purposes. In addition to fringes for clothing and accessories, we also carry trimming goods for scrap-booking projects, cake decorations, marriage invitations, card businesses and other uses. Please contact us.